(COLLEGEVILLE, Minn.)--University of Mount Union College senior safety Alex Ferrara (Independence/Walsh Jesuit) was named one of 10 finalists for the Gagliardi Trophy given to the top all-around football player in NCAA Division III. Ferrara has been a consistent performer for four years on one of nation's top ranked defenses. He is a three-time All-OAC selection, including first team nods in 2010 and 2011, as well as a 2010 All-North Region selection. He has two of his career 12 interceptions this season and scored a touchdown off a fumble recovery against Marietta. He also has blocked a kick and forced a fumble this season. Off the field, Ferrara, who has a 3.77 grade point average as a business major, is an Academic All-OAC, two-time Academic All-District and an Academic All-American in 2010. He has aided in service projects such as Hugs for Haiti earthquake fundraiser, visited local schools with the Raider Buddy program and assisted with the Trick-or-Treat with the Raiders. In 2009, he traveled to El Salvador to help a needy village on a mission trip. A record five other Purple Raiders have won the Gagliardi Trophy. Quarterback Jim Ballard won the inaugural award in 1993, fellow quarterback Bill Borchert in 1997, running backs Chuck Moore and Dan Pugh won the award in 2001 and 2002, while quarterback Greg Micheli won the award in 2008. 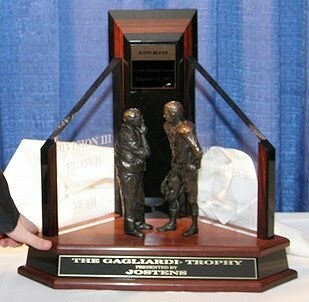 The Gagliardi Trophy was first presented in 1993. Since that time, the award has become one of the leading collegiate football awards and is widely recognized as the premier individual award in Division III football, honoring excellence in athletics, academics and community service. The award is named for John Gagliardi who has been a college football coach for the last 63 years and 59 of those at St. John's University inCollegeville, Minn. He is college football's all-time wins leader with 484 victories. Nominations for the award are made by the college president with supporting letters and credentials provided by the head football coach. After screening the nominations, the SJU J-Club Board of Directors narrows the field to 10 finalists including at least one finalist in each of the four NCAA regions. The 35-member Gagliardi Trophy national selection committee reviews the credentials, ranks the candidates 1-10 and casts their votes. For the third year, fans will be given one collective vote by casting votes on the web site www.d3football.com. The student-athlete with the highest vote total is named recipient. The field will be narrowed down to four regional finalists who will be invited to an award dinner where the the winner will be announced at banquet on Wednesday, Dec. 14 as part of festivities leading up to the NCAA Division III National Championship game, the Stagg Bowl, in Salem, VA.
WAYNESBURG, PENNSYLVANIA – Sophomore guards Kevin Krakowiak (Valley City/Holy Name) and Grant Fairhurst (Ashland) each scored a game-high tying 12 points as the Baldwin-Wallace College men’s basketball team defeated Waynesburg (Pa.) University, 78-39, tonight (Tuesday, November 22, 2011) in the Rudy Marisa Fieldhouse. B-W would open the second half on an impressive 22-0 run and did not look back as it went on to win by 39 points. With the win, B-W improves to 2-1 on the season and Waynesburg falls to 1-3. In addition to Krakowiak and Fairhurst for B-W, junior guard Ben Umbel (Poland/Seminary) had seven points, five rebounds, five steals and three assists. Sophomore All-OAC forwaed Kyle Payne (Brunswick) added eight points and freshman forward Matt Solden (Mentor) contributed a career-best six points. Waynesburg was led by Larry Alexander 11 points. B-W opened the scoring when Tyler Ferrell (Brunswick) split a pair of free throws at the 18:11 mark of the first half to take a 1-0 lead. After Payne split a pair of free throws, Waynesburg responded with their first bucket on a jumper from Jacob Fleegle at 17:13 to tie the game at 2-2. B-W then went on a 8-0 run to take a commanding 10-2 lead at the 14:25 mark when Fairhurst nailed a three-pointer. Waynesburg cut the lead down to just two points (21-19) on a pair of free throws by Luke Baker at the 3:14 mark. B-W would close out the first half on a 11-2 run and lead 32-21 at the intermission. BEREA, OHIO – Sophomore Jessica Lairson (Louisville) scored 13 points as the Baldwin-Wallace College women’s basketball team defeated cross-town rival Case Western Reserve University, 69-64, tonight (Tuesday, November 22, 2011) in the Ursprung Gymnasium inside the Lou Higgins Center. Lairson has led the team in scoring in all four games. With the victory, the Yellow Jackets improved to 3-1 on the season and Case fell to 2-2. In addition to Lairson, freshman guard Audrey Smolik (Strongsville) scored a career-high 14 points and junior forward Nancy Coulter (Washington Courthouse/Miami Trace) added a season-best 11 points. Senior forward Catherine Spisak (Sandusky/St. Mary’s Central Catholic) grabbed a game-high 11 rebounds and added four points. The Spartans were led by Evy Iacono with a game-high 21 points. B-W opened the scoring on a layup by Coulter off the assist from Spisak at the 19:20 mark. Case would take the lead (4-2) on a pair of jumpers by Erin Hollinger and Marissa Miles at17:42. The Yellow Jackets would go on a 5-2 run as junior wing Jessica Carpenter (North Canton/Hoover) would first hit a three-pointer and Smolik connected on a long range jumper at 16:18. After exchanging basket for the next three minutes, the Spartans would tie the game (11-11) for the second time as Destinee Henton would split a pair of free throws with 13:04 remaining. B-W would close out the half outscoring the Spartans 25-17 over the final seven minutes to take a 36-28 lead at the intermission. Case Reserve would open the second half on a 10-6 run to cut the lead to four points (46-42) on a jumper by Brooke Orcutt at the 15:04 mark. The Spartans would cut the lead down to two points (52-50) when Emily Mueller would score on a layup at 11:21. The Yellow Jackets would then go on a 7-2 run to increase their lead back to seven points (59-52) that was capped off by a pair of free throws by Smolik at 8:30. Undaunted, Case would outscore B-W 12-10 over the remainder of the game but could come only as close as three points on two occasions with the last coming on a layup by Iacono with three seconds remaining. PAINESVILLE, OHIO -- Already off to the best start in school history, the Lake Erie College women's basketball team aims to open the season 4-0 for the first time when it plays its first road game of the season on Wednesday afternoon, Nov. 23, at the University of Pittsburgh Johnstown. The game will be the final one for the Storm before the Thanksgiving holiday break. LAST TIME OUT FOR THE STORM: Lake Erie jumped out to a 10-0 lead and never led by fewer than 13 after the midway point of the first half in a 24-point win over Notre Dame, 96-72, on Sunday night (Nov. 20). Alyssa Wagers led all players with 23 points and 11 rebounds and Stephanie Rogers also had a double-double with 21 points and 10 boards. Those were the 24th and 15th double-doubles of their careers, respectively. Jen Caiola scored in double figures for the third straight game and Allison Pavkov chipped in with a season-high 10 points off the bench. Martha Nagbe had 21 points to lead Notre Dame. ROGERS EARNS SECOND GLIAC PLAYER OF WEEK AWARD: Stephanie Rogers was named the GLIAC South Division Player of the Week Nov. 21 after her performance in wins over Salem International and Notre Dame. Rogers averaged 19 points and nine rebounds in the Storm's two wins. She scored 17 points, including the 1,000th of her career, and grabbed eight revounds against Salem and then posted a double-double with 21 points and 10 boards in the win over Notre Dame. It was the second time in her career that Rogers was named Player of the Week. She also won the award last season (Dec. 6, 2010). BEST START EVER: Prior to this season, the Lake Erie women had never started a season 2-0 let alone 3-0. In fact, the team had won its opening game just six times prior to this year. UP NEXT: Idle until after Thanksgiving, the Storm returns to action on Tuesday, Nov. 29, at home againstWheeling Jesuit University. CLEVELAND (University Circle) – Trailing 19-4 with 9:59 remaining in the opening half, the Case Western Reserve University men's basketball team reeled off a 21-8 before the halftime break propelling them to a 70-65 victory versus North Coast Athletic Conference foe Denison University on Tuesday, November 22 inside Horsburgh Gymnasium. With the victory, the Spartans level their record at 2-2 overall and have eight days off over the Thanksgiving break before returning to action on Wednesday, November 30 in a home game versus Oberlin College at 8:00 p.m. With the loss, the Big Red falls to 1-3 overall. With the deficit sitting at 15 (19-4) with just under 10 minutes left in the opening stanza, the Spartans started clicking on each end of the floor. During the Spartan comeback run, sophomore center David Thompson (Plano, Texas/Plano Senior) led the offensive attack with six points cutting the halftime deficit to just two at 27-25, including a lay-up with :01 remaining on an assist by junior forward Austin Fowler (Farmington Hills, Mich./Birmingham Brother Rice). Senior captain Tom Summers (Murrysville, Pa./Franklin Regional) and freshman guard Joe Mims (Aurora, Ohio/Aurora) each added four points, respectively. On the defensive end, the Spartan defense limited Denison to just 23.5 percent (4-of-17) shooting over the final 9:59 and forced two turnovers. In the second, the Spartans took the lead for the first time in the game with an 11-2 run covering the opening 3:32 of play with four markers from Thompson, a three-pointer from freshman guard Jordan Dean (St. Johns, Fla./Creekside), and two points each from Summers and Fowler, giving the Spartans their largest lead of the game at seven, 36-29. The Big Red slowly chipped away at the lead, eventually knotting the game at 48-48 on a free throw by Dimonde Hale with 8:37 left. Case quickly built its lead back up to seven at 57-50, capped off by a Summers’ jumper with 6:04 left to play on an assist by junior guard Robert Scott (Paoli, Pa./Conestoga). Denison was able to get within two on two occasions down the stretch, the second coming when Hale hit a free throw to make the score 67-65 with 13 ticks left on the clock, but Mims hit a pair of charity tosses and freshman guard Julien Person (Houston, Texas/Second Baptist) hit one of two free throws sealing the victory. Summers led the Spartan offensive attack with 17 points on 8-of-13 shooting and added four rebounds and two steals. Additionally, Thompson finished in double figures with 13 points and tacked on a team-high eight rebounds. Off the bench, McLoughlin added a spark with eight points and a career-best six rebounds in just 19 minutes. Denison was led by Hale with a double-double of 20 points and 10 rebounds, while Larry Farmer added 12 points and a game-high seven assists. Westlake – Seven Oberlin College Football players were honored by the North Coast Athletic Conference, highlighted by first-team selections Danny Enright and Clay Eaton. Earning All-NCAC Second-Team accolades were senior Jake Hochendoner and junior David Kalgren. Completing the list of honorees on the honorable-mention squad were Robin Witjes, Tyler Benson and Shawn Chrapczynski. Eaton had one of the best of defensive seasons in school history as he led the NCAC with 11 sacks, which is good for second on Oberlin’s all-time list. A Findlay, Ohio, native, Eaton also finished third in the league with 17 tackles for a loss. He will enter the 2012 season just three sacks shy of tying Chris Pisani (22.5) for the all-time record. On the opposite side of the line from Eaton was Hochendoner, who was a forced to be reckoned with as well. The Poland, Ohio, native finished second on the team in sacks (6) and tackles for a loss (10.5). His 59 total tackles were third best on the squad and he also tied for the team lead in fumble recoveries (2) and forced fumbles (2). For the second straight season Kalgren found himself on the second-team. After leading the NCAC with four interceptions a season ago, many teams elected to throw away from his side of the field for most of the season and rightfully so. The Curwensville, Pennsylvania, native still tied for the team lead in solo tackles with 44 and ended the season with 52 total stops. He had two interceptions and six pass breakups. Witjes, who was a jack-of-all-trades for the Yeomen this season, earned his first All-NCAC honor. A dynamic threat as a wide receiver, wildcat quarterback and kick returner, Witjes tied an NCAC best with 6.2 receptions per game. He also ranked third in the league in yards (722) and his 98 all-purpose yards per game was fourth highest in the conference. Furthermore, the Howell, Michigan, native tied fellow Howell product Drew Mixter with a team-high six receiving touchdowns. Benson has been anchor on the offensive for the last three seasons, starting all 30 games in his Yeomen career. This season he was one of just two offensive linemen to start in all 10 games. His efforts at center helped the Yeomen have yet another outstanding offensive season as they ranked fourth in the league in scoring (22 ppg) and second in passing offensive (248.5 ypg). His protection allowed Josh Mandel to set the single-season touchdown passing record (20) in addition to the team single-game passing record of 458 yards against Washington University (Oct. 22). Chrapczynski, a product of nearby, Lorain, Ohio, completes the list of Yeomen award winners. The senior finished with a team-high eight pass breakups and tied for fifth on the team with 52 total tackles. He also had one fumble recovery, one forced fumble and one blocked kick on the year. Following an eight day break from competition, Cleveland State will return to action this Friday (Nov. 25) as the Vikings travel to Kalamazoo, Mich. for a 5:00 p.m. contest against the Western Michigan Broncos. The Vikings, who fell at Fordham (Nov. 16), 52-43 last week, enter the contest with a 1-2 record on the season. WMU enters Friday's contest searching for its first win of the season, as the Broncos have opened the year on a three-game losing skid. With four starters returning for the 2011-12 season, the Cleveland State women’s basketball team is poised to have yet another successful season under ninth year head coach Kate Peterson Abiad. The starting lineup is centered around junior Shalonda Winton (11.7 ppg, 9.0 rpg, 2.0 apg), a preseason first team all-league pick. Winton will combine with the senior trio of Janelle Adams (3.0 ppg, 1.0 rpg, 2.3 apg), Destinee Blue (12.3 ppg, 3.7 rpg) and Takima Keane (9.0 ppg, 2.3 apg) to form the backbone of the Viking roster. Peterson Abiad will have a deep bench to work with this season, as five additional letterwinners will be returning in juniors Honesty King and Kaila Montgomery (2.0 ppg, 2.3 rpg) and sophomores Ondrea Hughes (3.7 ppg, 1.0 rpg), Brandee Kelly and Haley Schmitt (0.7 ppg, 1.0 rpg). The CSU veterans will be joined by four freshmen, guards Cori Coleman (2.0 ppg), Kiersten Green (4.7 ppg, 2.7 rpg) and Tess Zufall and forward Imani Gordon (5.0 ppg, 2.7 rpg). Fordham posted a season-best 10 three-pointers and held CSU to a 36-percent clip from the field, as the Rams came away with a 52-43 victory. The Vikings were led by Takima Keane who tallied 10 points, six rebounds and two steals, while Shalonda Winton posted nine points and 11 rebounds. In her homecoming, freshman Cori Coleman recorded three points and one rebound, with her classmate Kiersten Green adding seven points. Following her first double-digit rebounding game of the season at Fordham, Shalonda Winton is just three rebounds shy of moving into 19th place on the all-time career rebounds list at CSU. Winton, who has 27 rebounds on the season and 487 on her career, ranks 20th behind Lynnette Hodge who tallied 489 career rebounds from 1990 through 1994. After the first two weeks of the 2011-12 season, Shalonda Winton is tied for third in the Horizon League in rebounding, averaging 9.0 per game. Her 27 total rebounds over the first three contests is tops in the league, while her 22 defensive rebounds also leads the league. Cleveland State head coach Kate Peterson Abiad is in her ninth season at the helm of the Vikings, and ranks second on the all-time wins list at CSU. Peterson Abiad became the third coach in program history to record 100 career victories last season, and currently has 107, needing just nine more to take over first place on the all-time wins list. Peterson Abiad has led the Vikings to four straight 19-win seasons, including a 21-12 record last year, the second most wins in program history. Cleveland State was picked to finish second in the Horizon League Preseason Poll, receiving 238 points. The Vikings finished behind preseason favorite Green Bay, who received 29 first place votes and 299 points. Wright State (212 points), Butler (197) and UIC (186) rounded out the top five. Detroit was the only other team to collect a first place vote, as they finished seventh with 141 points behind Milwaukee who placed sixth with 177 points. The Titans were followed by Loyola (88), Valparaiso (64) and Youngstown State (48). Junior Shalonda Winton was named to the 2011-12 Preseason All-Horizon League first team in voting conducted by the league’s 10 head coaches, sports information directors and select media. Last season Winton ranked sixth in the league in rebounding (9.1), seventh in blocks (0.8), ninth in field goal percentage (.462; 146-316) and 15th in scoring (12.5). She also became the fourth player in school history to grab at least 300 rebounds in a season, ending right on the number. The Vikings will play seven games against teams that advanced to postseason play last year, including Green Bay who reached the Sweet 16 in the NCAA Tournament. CSU will face the Phoenix twice, as well as Butler who played in the WNIT and Wright State who played in the WBI. The final game will come against Toledo, the 2011 WNIT champion. This season marks the third annual CSU Hoops Luncheon Series, with Viking basketball fans having the opportunity to get monthly updates from CSU basketball head coaches Kate Peterson Abiad and Gary Waters throughout the 2011-12 season. The luncheon will take place beginning at 11:30 a.m. on the fifth floor Viking Loge of the Wolstein Center annex. The next luncheon will take place on Wednesday, Dec. 14, with future luncheons to be held on Tuesday, Jan. 7 and Monday, Feb. 13. Reservations can be made by calling (216) 687-5454. Bluffton, Ohio – Sophomore Allison Gannon had a breakout performance as a the short-handed Oberlin College women’s basketball team went on the road to upend the Bluffton Beavers 68-56 on Tuesday night. Gannon poured in a career-high 22 points to go along with a career-best 14 rebounds to notch her second-career double-double. The Shelburne, Vermont, native went 10-of-17 from the floor in 36 minutes of work. Junior Kelly Warlich also helped the Yeowomen cause with 15 points and nine rebounds, while rookie Christina Marquette chipped in with 11 of her own. After missing all of last season with a knee injury, redshirt sophomore Lillian Jahan had the best day of her Oberlin career with nine points on 4-of-5 shooting. The first half was tightly contested throughout as no more than four points separated the two teams during the session. Oberlin would eventually take a 34-31 cushion into the locker room at the break. The Yeowomen would grab their first double-digit lead of the game at 49-39 with 11:13 left to play when Marquette cashed in a pair of charity tosses. Just moments later an Ashley Young triple-hit would give Oberlin its largest lead of the game, pushing the score out to 57-42. From there Bluffton would get no closer than eight points the rest of the way as Oberlin improved to 2-1 on the young season. The Yeowomen shot 47.4-percent (27-of-57) from the field, including an impressive 44.4-percent (8-of-18) clip from beyond the arc. The Beavers checked in with a 34.4-percent success rate, connecting on 22-of-64 attempts. Oberlin will now have nice long weekend to celebrate Thanksgiving before returning to action on Sunday afternoon at home against Earlham College. Tip-time is set for 2 p.m.
Oberlin, Ohio- The Oberlin College men’s basketball team won their game against the visiting Hilbert College Hawks. The final score of the contest was 67-56. Through the first 15 minutes of the first half, the game was back and forth, with neither team gaining a lead of more than seven points. There were four lead changes as well. However the Yeomen went on a 12-4 run to end the first half, making the score 36-28. The Yeomen had numerous contributors throughout the half. Andrew Fox started the game going 4-4 from the field and had 10 quick points. He also added 10 boards and six assists in the first period. Freshman Miles Gueno added six points, going 2-2 from behind the arc in the later part of the half for the Yeomen. Charlie Crawford-Silva added five points for Oberlin going 2-2 from the field as well. The Yeomen jumped out to an 11 point lead to start the second half and lead by double digits for most of the rest of the game. Senior captain Josh Merritt took over in the second half, scoring 14 points, including six free throws down the stretch. He finished the game with 17 points, six rebounds and four assists. Fox finished the game just an assist short of a triple double, but had a dominating performance to say the least. He had 17 points, to go along with a team high 14 boards and a team high nine assists.Geoff Simpson added eight points and five boards to help the Yeomen. The Yeomen are back on the court after a brief vacation for the Thanksgiving holiday. They travel to Case Western on November 30th, the game is scheduled to start at 8 p.m.
ALLIANCE, Ohio -- Mount Union's men's basketball team shot 70-percent in the second half (17-of-24) and rallied from a halftime deficit to defeat Westminster (Pa.) 88-64 in a non-conference game Tuesday at the McPherson Academic and Athletic Complex. Jimmy Wood (Wintersville/Indian Creek) had his first double-double of the season with game-highs of 20 points and 10 rebounds to lead Mount Union (3-1) to its third straight win. With game tied at 48 with 14 minutes left in the game, Wood nailed a three-pointer that sparked a 21-3 surge over the next six minutes that gave the Purple Raiders a commanding 69-51 lead. Wood and junior guardKeith Williams (Louisville, Ky./Brown) each scored seven points during the run. Williams came off the bench finished with a career-best 13 points on 5-of-6 shooting with four steals and three assists. Also in double figures for Mount Union were freshmen Nate Jacubec (Struthers/Struthers) with 17 points andStevie Griffin (Canton/Massillon Jackson) with 15 points as the Raiders shot a season-best 67.4-percent (31-of-46) for the game. Conversely, Westminster (1-3), which led 41-39 at the half, converted only 6-of-20 shots in the second half and finished with three players in double figures led by Anthony Thomas' 16 points. Mount Union goes back on the road to play Saturday at 3 pm at Waynesburg (Pa.). KENT, Ohio - Jeremy Montgomery scored 13 points and D'Aundray Brown added 11 as Cleveland State improved to 4-0 with a 57-53 win at Kent State on Tuesday night. The win was the 275th in the career of head coach Gary Waters. The Golden Flashes fell to 2-1. "This was a hard-fought game tonight, but I feel we made it tougher than we should have," head coach Waters said. "We didn't take care of the basketball and I was disappointed with the way we executed on offense. It was not one of our better games offensively, but I thought defensively, we played well and kept them from getting good looks. "I thought this was a very important game for us. We are about to hit the road for three games in three days and I thought it was paramount that we competed and got ready for this trip. We have three games in three days and are going to need everyone on the roster to contribute this weekend." The Vikings wasted little time in jumping on the Golden Flashes and silencing the sellout crowd quickly, jumping out to a 14-2 lead less than four minutes in. Montgomery highlighted the run with a pair of three-pointers. "It was important that we got out to a lead tonight in this environment," Waters said. "We kept the lead from start to finish and that was important." CSU's lead was still 12 points (19-7) with 10:27 left, but the Golden Flashes cut it down to six (21-15) on a Justin Manns layup with 4:41 left. However, the Vikings responded with a 7-1 run to push the lead to 13 points (28-15) with 2:31 left in the half. Brown hit a jumper with 11 seconds left and provided a blocked shot with 1.1 seconds left to give CSU a 30-21 lead at the half. Kent State cut the lead to five points on three occasions in the first nine minutes of the first half, the last one coming at 38-33 with 11:23 left. But once again, the Vikings answered.